Non-dormant seeds of Arabidopsis thaliana, ecotype Landsberg erecta (Ler), were used to study seed germination proteome. They are referred to as wild type seeds. Germination assays are carried out on three replicates of 25-64 seeds. 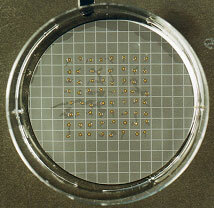 Seeds were incubated at 25°C, with 8-h light daily, on three sheets of absorbent paper (Roundfilter paper circles, Ø 45 mm, Schleicher & Schuell, Dassel, Germany) and a black membrane filter with a white grid (ME 25/31, Ø 45 mm, Schleicher & Schuell, Dassel, Germany) wetted with 1.3 ml of distilled water, in covered plastic boxes (Ø 50 mm). A seed is regarded as germinated when the radicle protruded through the seed coat. Dormant and non-dormant seeds of Arabidopsis thaliana, ecotype Cape Verde Islands (CVi), were used to study seed dormancy proteome. Seeds were supplied by Dr. Maarteen Koorneef (Wageningen, The Netherlands). To obtain the release of dormancy, dormant seeds were maintained at room temperature (21-24°C) in dry conditions (35-40% RH), which was fully achieved after 6 to 12 months of such a dry storage. For each test, 100 seeds were aseptically sown on a basal medium composed of distilled water buffered with MES (3mM, pH 5,7) and gelified with agar (7 g/l Noble agar, Difco). Germination assays were conducted in controlled culture room under 16-h photoperiod (Philipps TRW HOW / 33 RS tubes, 170 µM m-2 s-1), at 25°C (light period)/20°C (dark period). A seed is regarded as germinated when the radicle protruded through the seed coat.